A postcard of and from the most remote part of Great Britain features in our auction on 21 March. It is from St Kilda, an archipelago of granitic rocks, 40 miles west of North Uist, in the Outer Hebrides. The largest island is Hirta, with the highest sea cliffs in the UK. It was inhabited until 1930, when the remaining 36 inhabitants emigrated to the Scottish mainland. In Edwardian times the population was steady at between 75 and 80 and a number of postcards of the village were produced by mainland publishers and shipped to the island for use by the locals and the occasional visitor. 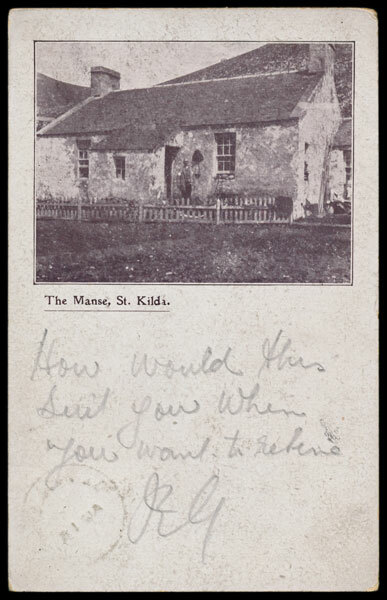 Lot 182 is a vignette card showing The Manse on Hirta, which had been built in 1830, when a new church was built at the eastern end of the village. This is a rare view card of St. Kilda, but what makes it even more desirable is that it postally used from St. Kilda. It bears the message below the illustration "How would this suit you when you want to retire? RG" It is addressed to The Revd G. Lawson, The Manse, Wigtown, which is a town in Dumfries and Galloway. 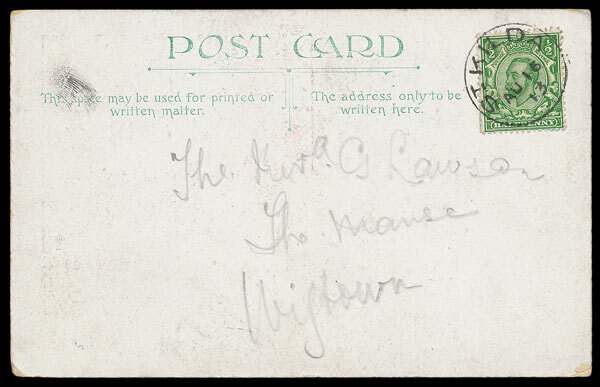 The card bears the circular date stamp of ST. KILDA AUGUST 16 1913. It would be wonderful to carry out research and find out whether “RG” was the vicar on St. Kilda in 1913 and whether he emigrated to the mainland in 1930 – or was he replaced by his correspondent, the Rev. G. Lawson? An intriguing and rare survival!